In typical ADD (or is it the brilliant acknowledgment of the public's ever shortening attention span) style, Crispin Porter + Bogusky is out with yet another iteration of Microsoft's $300 million campaign. This time, perhaps anticipating the fact $300 million might not remain $300 million given current economic conditions, the agency is treating us to...wait for it...CONSUMER-GENERATED CONTENT! Yes, you read that right, bucko! Rather than Jerry and Bill, we'll be treated to...Mr and Mrs. Nobody With A Video Camera. 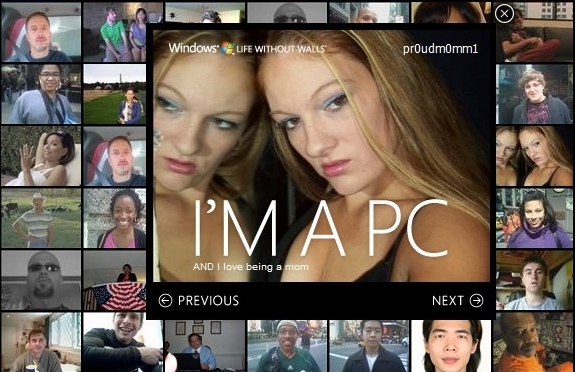 The videos, which call for people to say, "I'm a PC" followed by some inanity, have been integrated into television commercials which are currently airing. Check out over 17,000 videos and photos here. Does anyone else have a problem with the positioning in these ads? I feel like they should have positioned themselves as an operating system company rather than not a mac.. it just doesnt make sense. when did windows become a pc? why arent macs pcs (the only answer i can think of is their ads say they arent)? i think they should have showed users running windows on every computer macs included. apple is no different than dell. macOSx is no different than windows. right?! wtf are they trying to redefine what those words actually mean? - i really think they should have commercials with people using macs saying im a pc. Where are all the pretty people? This is television. Hollywood. If I wanted to see everyday Joe, I'd be half-way to Rancho Cucamunga. Let's upload a few nicely done versions of "I am politically correct and work on a MAC" or "I have a PC with Vista and it blows." no bashing, no bragging, no "i'm better than you"